On April 9, 1, Willie Nel992son and Kris Kristofferson star in CBS-TV’s “Another Pair Of Aces: Three Of A Kind”. Aces’ will return to Austin, early next month for a sequel and the producers are seeking numerous extras for the filming. A variety of ages and types are needed for several scenes in the movie, including a courtroom and press conference, and scenes at a political fundraiser garden party in which extras will need to be well-dressed, according to Helen Griffiths of Third Coast Casting. Clean shaven men in thier 40?s are being sought to pay Texas Rangersm as well, she said. Extras are p;aid $40 a day and they could be needed on the set for several days. A casting call for extras is scheduled Wednesday, December 19th from 2:00 – 8:00 p.m. at the Sabine Room of the Stouffer Austin Hotel, 9721 Arboretum Blvd. Griffiths said applicants should bring a recent photograph of themselves. 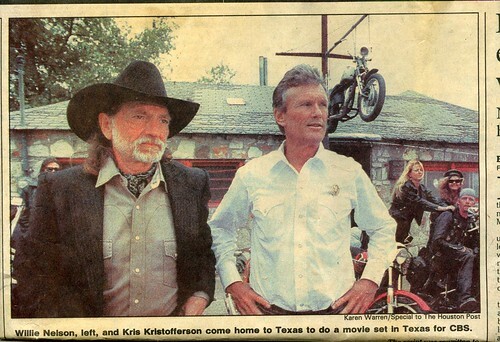 Nelson plays Billy Ray Barker, a con man and Texas Ranger Rip Metcalf is portrayed by Kris Kristofferson. Rip Torn stars as retired Ranger Jack Parsons. ‘A Pair of Aces,’ which aired last January to excellent ratings, was written by Austinites Bud Shrake and Gary Cartwright, who are executive co-producers for the sequel. Spotlight Pictures is set to release Lian Lunson’s much awaited film, Waiting for the Miracle to Come, to international markets. 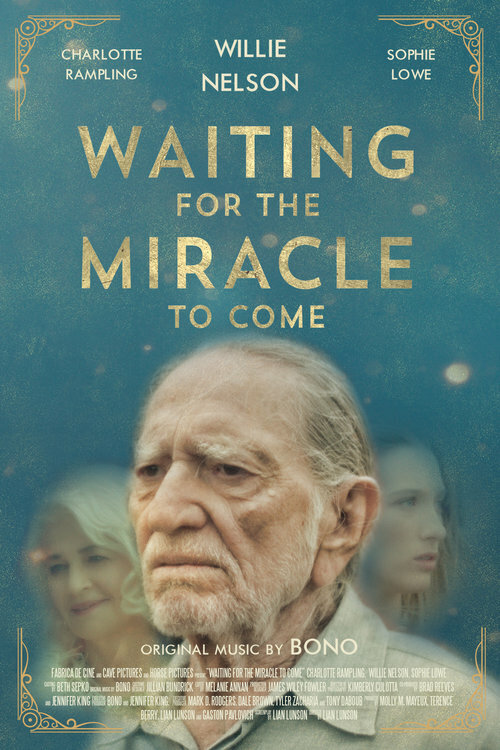 Starring Willie Nelson, Charlotte Rampling, and Sophie Lowe, Waiting for the Miracle to Come a gorgeous, evocative, and meditative film about faith, love, and fulfillment in spite of loss. Waiting for the Miracle to Come is about connections—what they mean, what they feel like,” Lunson says. “It is styled in otherworldliness to bring the supernatural element closer.” Audiences will find themselves transported into this dreamlike world, discovering “gold” in hidden places throughout. 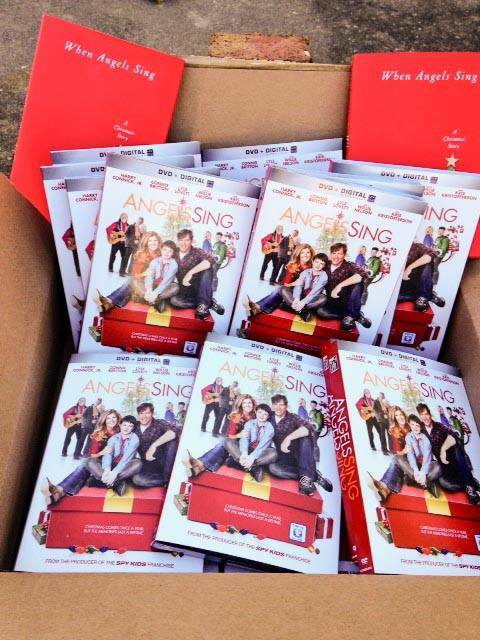 Enter to Win a Free DVD! Three lucky winners will be the first to receive our beautiful Collectors’ Edition Blueray DVD. To enter to win, sign up for our email list below! 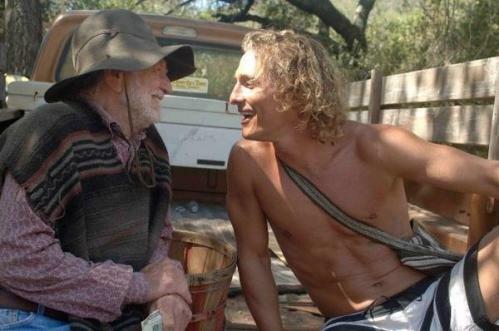 The winners will be announced on Willie’s Birthday, April 29th. This remake of the John Wayne classic was released in May 1986, exactly one year after the Highwaymen’s debut album hit shelves, and it more or less functions as a Western-themed commercial for the chemistry between Willie Nelson, Johnny Cash, Waylon Jennings and Kris Kristofferson. They’re not the only country stars here, though. With additional cameos by June Carter, Jessi Colter and David Allan Coe, Stagecoach cracks its whip by focusing on country star power, not necessarily acting ability. 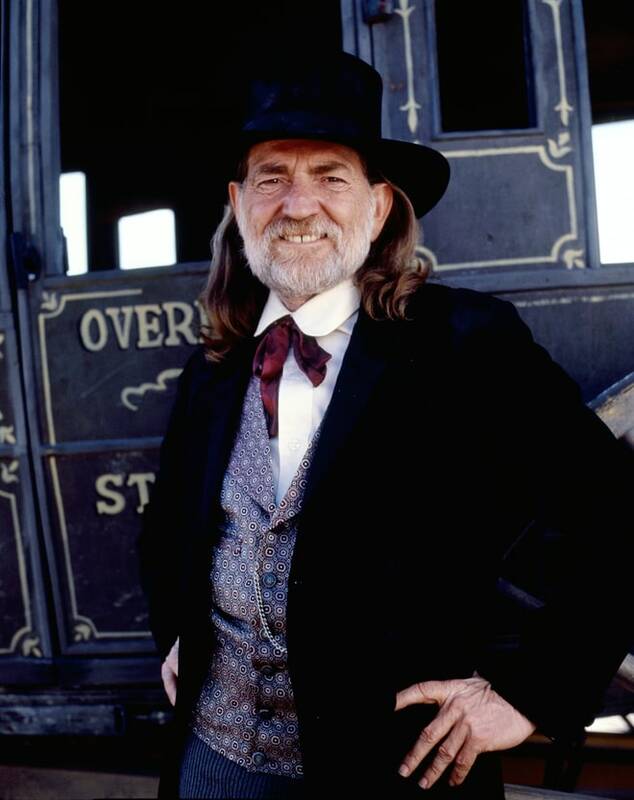 On May 18, 1986, Willie Nelson, Johnny Cash, Kris Kristofferson and Waylon Jennings appear in a CBS-TV remake of the western movie “Stagecoach,” along with June Carter, John Schneider, John Carter Cash, Jessi Colter, David Allan Coe and Billy Swan. 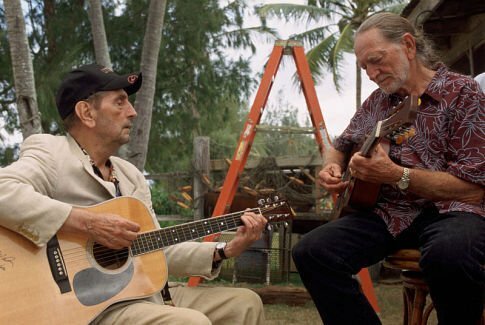 This movie stars Willie Nelson, and his Highwaymen buddies, Johnny Cash, Kris Kristofferson and Waylon Jennings. Great soundtrack, lots of Trigger playing throughout. 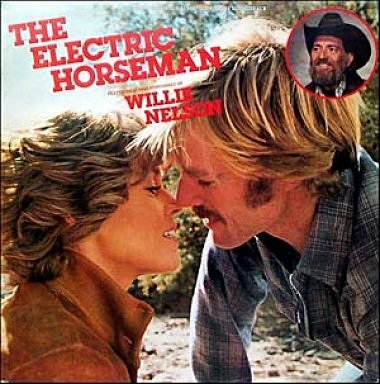 Willie sings the title song, which he wrote with David Alan Coe, who also is in the movie, along with June Carter and other faces you will recognize. The 2015 all-star concert celebrating @johnlennon‘s 75th birthday is available now on 2LP, 2CD, and 2CD + DVD. Features performances by @aloeblacc, @WillieNelson, @SherylCrow, @juanes & more. 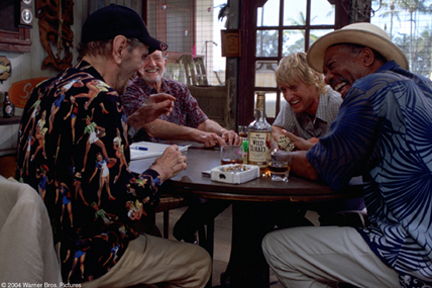 On January 30, 2004, the movie “The Big Bounce”, opened. 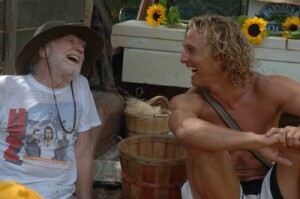 Surfer Dude, the movie starring Matthew McConaughey, Woody Harrelson and Willie Nelson, will be released on DVD and on Blu-ray Disc on December 30. Extras features will include a commentary track, behind-the-scenes footage, deleted scenes and webisodes, whatever those are. 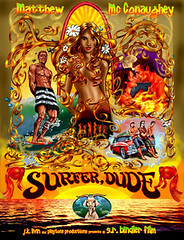 Surfer Dude on Blu-ray will carry a suggested retail price of $34.98. Already a holiday movie favorite! 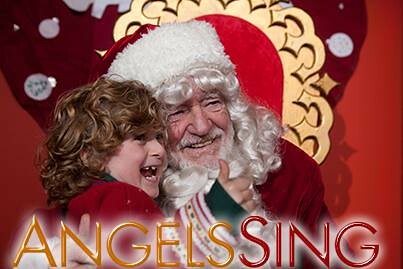 “Angels Sing”, starring Harry Connick, Jr., Willie Nelson and Connie Britton now available on DVD. He makes his living robbing banks. She makes hers banking on robbers. Willie Nelson stars with Jack Elam, and Delta Burke in this move about two outlaws on the run after stealing and hiding a large amount of gold. The two find themselves travelling through 1895 Mexico on a train full of dynamite as rebels, Apache Indians, Wells Fargo agents, and Federal troops trail them. When they are captured by the Mexican authorities, they scheme to keep their ill-gotten riches with the help of a madam and her prostitutes. 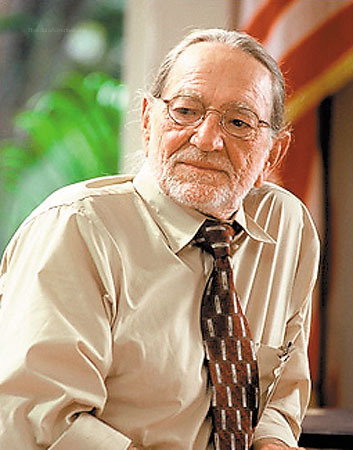 Willie Nelson, Jack Elam, Delta Burke star in this rowdy western.